I am currently attending the Learning Forward (NSDC) conference in Atlanta. I am presenting a session titled Verbal Skills for Heavy Coaching. 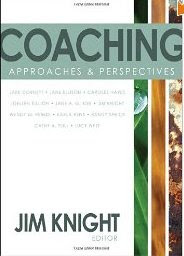 In an earlier blog, I discussed the definitions of light and heavy coaching as presented by Joellen Killion, Coaching Heavy and Coaching Light in Coaching: Approaches and Perspectives edited by Jim Knight. Joellen states that Heavy Coaching requires high stakes conversation between coaches and ALL teachers that focus on teaching and learning. She lists Coaches’ Beliefs that can Interfere with Coaching Heavy and their side effects. I have seen coaches struggling with several of the seven beliefs from her list. 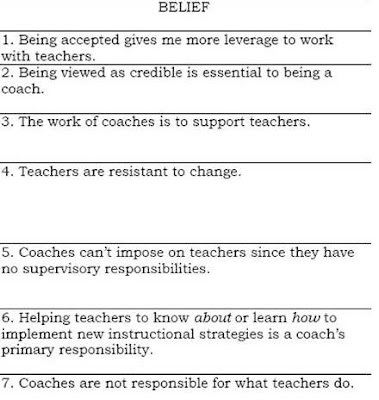 The work of coaches is to support teachers. I have begun questioning what coaches mean when I hear that statement. My suggestion to them is that the job of the coach is to change teachers (Build Capacity/ Continuous Growth). As coaches are assessing “how their time is spent,” looking for teacher change causing increased student learning should be the goal. Just this week I was working with high school math coaches who were pulling students and providing scaffolding background for missing skill sets. They struggled when I asked them how the teachers would be changing/growing from their work. These coaches are working in several schools. They are very busy and working hard. Yet it will be difficult to show teachers becoming stronger from their work. I often find that these support activities are initiated to generate a sense of coach as a team member but have a way of becoming time consuming and comfortable. Coaches can’t impose on teachers because they have no supervisory responsibility. This has to begin by checking your meaning of impose: (2) to force (oneself, one’s opinions etc) on a person The headmaster liked to impose his authority on the teachers. I guess if you take this definition, coaches do not have the positional authority to force a teacher to change. However the coach’s position to ask questions, present observational feedback, review student data, and model possibilities can impose “brutal facts” upon teachers. Coaches are in a position to make teaching a more public act. Using coaching conferences, professional learning communities, team meetings, and professional development coaches can impose a continuous teacher reflection of beliefs and decisions. When asked what she should do, I said let them know up front that you only model when there is a pre-agreement that you will be returning to coach. Design an observation form for the teacher to use during the modeling and return using the same form as the teacher practices. If asked why you impose that requirement, point to the research. The likelihood of change in teacher occurring from modeling alone is too small. Coaches are not responsible for what teachers do. I suggest you pull Joellen’s beliefs list and use it with your faculty to explore everyone’s beliefs about the outcomes and responsibilities of your coaching program. I do feel as if all my “professional stars” are aligned this week as I have been wrestling with the where-can-I-fit-to-make-the-best-impact of soul searching. I finished reading, on the recommendation of a close friend, Donald Miller’s A Million Miles in a Thousand Years: What I Learned While Editing My Life. While it is not directly related to coaching it did resonate with some of the very same issues. If I don’t like the story I’m living, live a different story. I realized that what I was doing in coaching, and the way in which I was seeking coaching opportunities was drying out and I needed to try something different. I needed to be willing to take a risk just as I was hoping the teachers in my building woud be willing to do. Scary, but necessary if change is to happen and make me better at what I’ve been entrusted to do. I love Joellen’s framework of beliefs and realize that my own constructs and beliefs needed revising. Thank you, Steve, for making this your topic this week. I agree with all that you’ve outlined, and know that I am basically in the “coaching light” stage. Not where I want to be after 6 years in the position. I find that my frustration at not being able to move forward with my staff has pushed me into working more with students where I feel like I can make a difference. I think I need to reflect on what I can do to change that. I probably should read Joellen’s book-thanks for bringing it to my attention! Boy, we should talk! Your comments sound so familiar as I’m in my 7th year and I had to do something different in order to get different results and to create a new path in order to bridge the gap with teachers. Feel free to contact me at kswanson@eastpennsd.org. You raise an issue that you may not even realize exists–just how are coaches evaluated? I’m curious how other districts complete performace evaluatons. Your question about the evaluation of coaches is right on. When I am asked that question, my response is that an evaluation should be based on the successful execution of the plan that the coach and supervisor of the coach create. If the supervisor is not the principal, I feel that the principal needs to be involved in the process. Key is that coach, supervisor, and principal all own part of the evaluation.